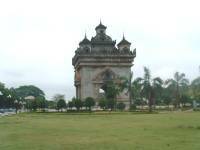 Next day we flew to Vientiane, Laos. Laos Airlines has a bit of a reputation for delays and we were prepared for a wait at Siem Reap airport. To our surprise we took off at the scheduled time. Reading the Laos Airlines magazine they are trying to improve their services on both domestic & international flights. 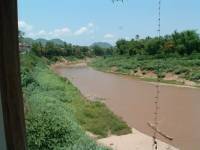 This is good news for us as some of our clients have experienced delays & cancellations on visits to Laos. The flight from Siem Reap to Vientiane stopped in Pakse, taking off again within 20 minutes. The whole flight is a little more than an hour. The new international flight terminal in Vientiane airport is nice & bright compared to the old building which is now used as the domestic terminal. The airport is not very busy so there is no long waiting for passport & visa procedures. Our Laos agent and guide were there to welcome us with smiling faces. Na is a polite young man with good spoken English & knowledge of his city and country. We checked in at the 5* deluxe Setha Palace Hotel. This elegant colonial style hotel has all the beauty & luxury of a deluxe class hotel. The hotel has been restored to its former glory with French architecture, colonial décor, period furniture & the landscaped garden & pool. This old world charm blends in very well with the city. For our lunch our agent took us to the Mekong Restaurant. As the name suggested the restaurant is looking down to the Mekong River, with Northern Thailand across the other side of the river. It’s amazingly close. The lunch menu included fish soup, pork in chilli sauce, omelette, mince with herbs & lettuce wrap, mixed vegetables & rice. Drinking a large bottle of Beer Lao & enjoying the view of the Mekong River at your feet is a wonderful experience. Our tour in the afternoon included a visit to Ho Prakeo, Wat Sisaket, That Luang & Pratuxay Monument. 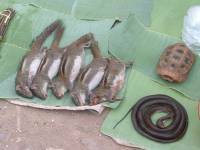 These are the main attractions in Vientiane centre. 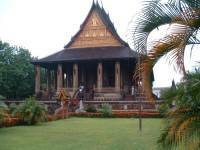 Wat Sisaket is the oldest temple in Vientiane, built in 1818. The two big imposing Nagas guard the entrance to the temple. The heads of the two Nagas, looking like dragons, rest on either side of the steps and the tails roll upwards along the steps to the top. There are many seated or standing Buddhas along the outside wall of the temple. There are more Buddha statutes of various sizes inside the dark temple. 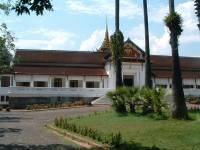 Ho Prakeo is the formal Royal temple of Laos Monarchy but has been converted into a museum with many best examples of Buddha sculptures. Pratuxay standing in the middle of the main road in Vientiane city looking like the Arc de Triomphe in Paris is a monument to commemorate the Lao people who died in pre-revolutionary wars. A stairway, with souvenir shops at each level, leads you to the top with views of the city. Finally, That Luang is the most important & impressive monument in the city. The gold Pha That Luang is built within walls & walkway on each level with stairways going upward toward the Gold Dome. The peaceful courtyard surrounding the temple with the walls protecting you from the outside world is spiritual & restful. Before the afternoon sunset we went about town in search of a suitable 2-3* standard hotel to offer to our clients in Vientiane. We choose the Tai Pan as our new standard hotel in Vientiane. 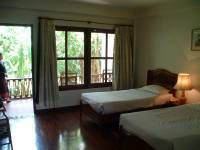 The Tai Pan is a delightful small hotel situated in a fantastic location within yards of the Mekong River. The lobby is lovely & warm with brown wooden furniture & relaxing lighting. The rooms are spacious & most importantly there is a swimming pool with fitness centre. A walk along the Mekong River in the evening is enjoyable. There are tables & chairs under the dim light bulbs or gas lamps for local outdoor eating by the river. The atmosphere is local & non-commercial. Our evening dinner was at the Mala Restaurant. An out-of-town restaurant in a local setting serving crab soup, deep fried shrimp in batter, stuff squids & mixed vegetables for our meal. The usual desert of mixed fruits with mango tasted so fresh & delicious. We flew to Luang Prabang next morning. Our beautiful guide, Horn, was waiting at the arrival gate with a board made of carved wood, the welcome sight of Dragon Travel on it. Like Na in Vientiane, Horn also speaks good English. We checked in at the 5* deluxe Pansea hotel. Like the Pansea in Siem Reap it is a top-notch luxury hotel. 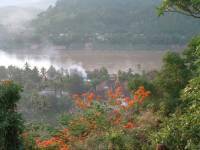 It is situated on a hillside overlooking the town and surrounded by tropical vegetation. It’s a haven of tranquillity. The restaurant has open doors leading onto the patio and down down to the swimming pool - an 'infinity pool' with water running over the far edge offering an uninterrupted view of the tropical landscapes beyond. This is the best view I have ever seen from a swimming pool. Our room with an outside terrace/open balcony also has the same view of the mountain & forest. Like in Vientiane our lunch is by the river at Camkarn riverside restaurant. The restaurant is perched on the edge of the Nam Kham River with views of the river running below & the green hills on the other side. A few local boys are swimming & fishing. I drank my Beer Lao contemplating this unspoilt rural beauty. We lingered over the spicy vegetables (hot), local sausage, mince with herbs, soup & mixed fruits for desert. Our guide had to remind us that it was time to go for our tour in the afternoon. The programme in the afternoon was a visit the Royal Palace Museum, Wat Visoun, Wat Xieng Thong & finally the Phou Si Mountain to see the sunset. The former Royal Palace is now a museum and the royal history is well documented by the collections & photographs. The rooms are re-constructed as in the past, such as the King’s & Queen’s bedrooms & dining room etc. 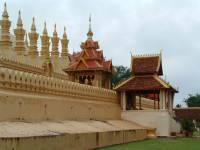 Wat Xieng Thong is the most magnificent temple standing high up looking over the Mekong River. A long stairway from the Mekong River bank all the way to the temple only cut through by the road half way up. 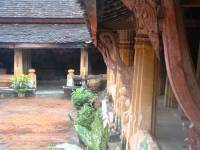 A magnificent setting for this classic Luang Prabang temple architecture with a roof that sweeps low to the ground. Apart from the temple there is a royal funerary carriage house displaying an impressive funerary carriage that stands 12m high. There are also several other halls containing Buddha images of the period. 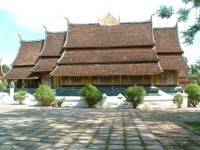 Wat Visoun was built in 1513, making it the oldest temple, but was rebuilt in 1896 because of the fire set by the Black Flag Haw. We went back to Pansea hotel to cool off in the pool & by 5pm Horn picked us up & drove to the Phou Si Mountain to see the sunset. The nightly market was beginning to be laid out in the street below, all the attractive local arts & crafts. The road is closed to traffic from 5pm onward for the nightly market. We walked through the exciting display of local colour & materials. The effort of climbing a couple of hundred steps up to the Phu Si temple is rewarded with a fantastic view of the city with the Mekong River & temples on one side, the airport runway & mountains on the other side. The sun slips down behind the Mekong River. There are many people to witness this natural beauty, and the monks wondering around are happy to enter conversation with you or be photographed with you. I was intrigued to learn from one of the monks is that many of them will leave the monastery to re-enter normal life. For dinner we went to the Indochina restaurant. It’s a lovely setting in the garden of the restaurant with musicians playing traditional music under the tree at the corner of the courtyard. There are colourful lanterns dangling from the trees lighting the tables & our food. It’s a romantic setting with good food too. We had chicken curry, sweet & sour fish, mixed vegetable & vegetable soup. 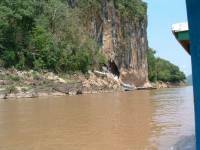 Next morning was a wonderful trip by boat taking about an hour along the Mekong River to see the Pak Ou Caves. The vast muddy-colour river with some areas of fishing nets & children bathing on the riverbank, green hills & mountain on the background is unspoiled. The boat journey was broken by a stop at the Ban Thin Hong, Hmong village. The locals are selling their arts & crafts, also rice wine that is being made in one of the stores. Another short ride took us to the Pak Ou Caves. Climbing up the steps to the lower cave gives you a lovely view of the Mekong River joining the Nam Ou river at the mouth of Pak Ou village on the other side. It’s very photographic scenery like a watercolour painting. Stepping into the lower cave overwhelms you with hundreds of Buddha figures all over the cave. Horn told us that there used to be many more, but visitors have stolen some of the fugures. Local people & other Asian visitors come here to pray. This cave is a shrine to them. Walking out of the cave & turn left following the path & more steps upward leads to the upper cave. The upper cave is not as much visited by people and is completely in the dark - but you can rent a torch for a small sum. There are some carvings as well as Buddha figures scattered around in the dark. We returned by boat & had lunch at the Thapbubpha Restaurant in town. A small local restaurant serving us lovely dishes like fish soup, stewed meat, mixed vegetable & omelette. After lunch we checked out of the Pansea & checked in another deluxe hotel, The Grand. This is a completely different style of hotel with elegant French colonial style. The garden is beautifully designed with waterways & pools among the tropical trees & plants. 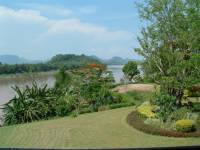 The best thing about this hotel is the view of the Mekong River running along at the back of the hotel. Some of the rooms have the most beautiful views of tropical gardens leading down to the Mekong River with the mountains on the opposite side beyond. This view from our room looked almost like a landscape painting hung outside the patio door! We sat on the chairs outside on the balcony enjoying this luxury for hours. We have made a request to the hotel to offer rooms with the river view to all our clients. The breakfast restaurant is right at the edge of the Mekong River & we lingered over our breakfast taking in this lovely scenery. It is simply beautiful. Horn also took us to visit Ban Xingkorn village in the afternoon. Here we saw the locals working for cotton & silk hand weaving. We also visited a very interesting hand made paper factory. We were shown step by step how the paper is made starting from the tree at the factory. The finished goods are almost an art form in themselves. Next morning we woke at five a.m. and went down in to town to experience Luang Prabang morning life where locals line up in the street to give rice to the monks. It was a wonderful experience not to be missed. Hundred of monks in groups of twenty or more walk along the street holding out their bowl for the people to place sticky rice in them. My agent put a long mat on the road & we knelt with bowls of sticky rice in our hand. As the monks walk pass I grasped a handful of rice to put into each of their bowls one after another. I felt so utterly happy. I carried on until all the rice had gone & the monks returned to the monastery. Some of the monks are as young as five years old. I was overwhelmed. We walked around the morning market that includes all interesting vegetables & meat (some of the meat on display is not for the faint-hearted!) before we went back to the hotel for our early breakfast by the lovely Mekong River. Afterwards we were off to inspect more hotels, especially in the standard category. We chose Le Parasol Blanc & Mouang Luang for our standard hotels in Luang Prabang and for the superior hotel we chose the Villa Santi Resort. The Deluxe hotel will be either the Pansea or The Grand of course. We left Luang Prabang & flew back to Vientiane. Our agent manager was at the airport to meet us. We checked in the 4* Laos Plaza. It’s a modern hotel with good facilities at the heart of the city. Our lunch was at the superb Kualao restaurant with dishes such as Mekong fresh steamed eels with lemon grass in banana leaf, sweet & sour prawn, spring roll, chicken seasoned with tomatoes sauce & chicken with cashew nut. It was delicious. For evening at the local Thai restaurant the dishes were equally good with fish soup, beef with mushroom, mixed vegetable etc. Next day we left Vientiane to Bangkok. In both Vientiane & Luang Prabang airports our agent will check in for you with your passport & air ticket while you wait. When all is ready our agent will take you to the departure gate for your flight. Again the flight to Bangkok departed on time. We hope Laos Airways will keep on the good work from now on!